Creating a card that will leave a positive impact on prospects is of vital importance. Your business card is a large part of the first impression you give to your potential customers. Your business card is also a lasting impression and often is kept for future use. Therefore, creating a card that will leave a positive impact on prospects is of vital importance. One way to do this is to print your business cards with a full bleed. Printing with a full bleed means that your background color or image and any other graphics desired will extend beyond the edge of the card. Without full bleed printing, your business card will contain an unprofessional white line between graphics and the edge of the card. Make sure that your cards are printed correctly with full bleed by following certain layout requirements. 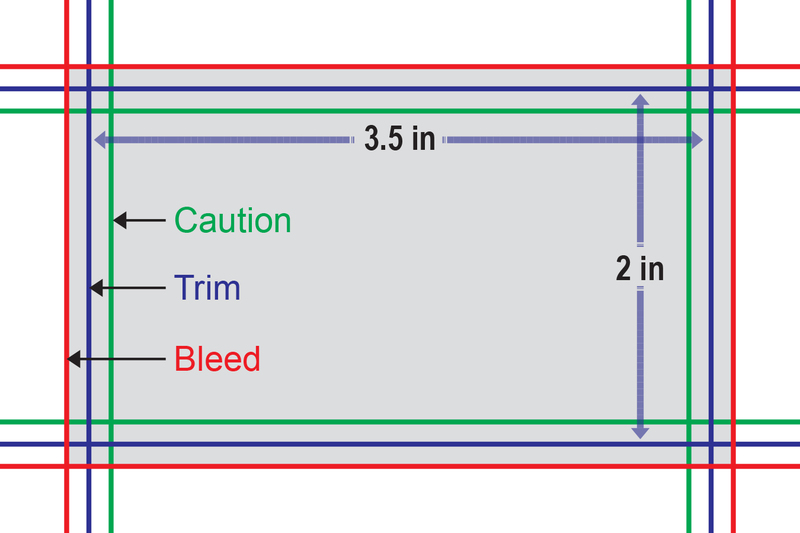 Step 1: Design your card to be 3.75" x 2.25"
Your printer will print your design the size you design it, and once the card is printed, it will then be trimmed down to the standard 3.5” x 2.” This extra step will ensure the highest possible edge quality. Step 2: Keep all text and important graphics 0.125” away from the trim line. Your text and graphics must be within 3.25”x1.75” to be sure that it will not be trimmed off the business card. That means that your title and logo must be far enough away from your edge so that they look right when the 1/8” bleed area is cut away to create the final card size. Make sure to save your design file in the CMYK color mode. If you use RGB to design your card, simply convert it back to CMYK before it goes to the printer. After choosing your printing options on the order form, upload your finished design on printplace.com. Remember that you can always design or check the dimensions of your design with our easy to use templates before uploading. Printing full bleed business cards is easy with PrintPlace.com. We offer excellent customer service just in case you have any questions about uploading your files or designing for full bleed. Even better is our Instant Pricing tool that will adjust your quote as you change your printing choices on the order form. With color quality control throughout the entire printing process and a top notch guarantee, you can’t go wrong ordering your business cards through PrintPlace.com. Proudly distribute your message with quality paper and coating.